The object is to play all of your tiles on the board before your opponent does. The game is played in 4 rounds. The player with the least penalty points wins the game. White is the starting player in the first round and the starting player is switched every new round. In the beginning of a round a random tile is placed open on the board. This is the start tile. The start tile cannot be a double value tile. Below an example start situation. 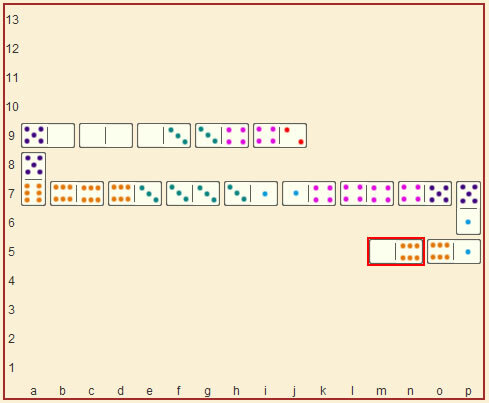 There are 28 different domino tiles in this game (double six set). See below for all domino tiles. You can only place a tile that has exact the same number of dots on it as on the tile where you place it on. Tiles with a double value do not have a special meaning in this game. They are used in the same way as other tiles. If you cannot move, you have to draw as many tiles from the boneyard as needed for you to be able to play a valid move. This is done automatically on YourTurnMyTurn.com. As soon as there are 2 tiles left in the boneyard and the player on move is not able to play a valid move, the round ends as well. At the end of a round players get penalty points for any tiles left. The penalty points are the values on the tiles left added up. If the winning player has no more tiles left, the opponent gets an extra 5 penalty points. In the image below you see a possible end situation where a player has no more tiles left. The game ends if 4 rounds are played. The player with the least penalty points (over 4 rounds) wins the game. If both players have the same amount of penalty points, the game ends in a draw.